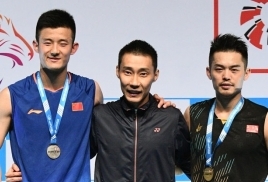 Kento Momota showed why is the world champion and the current world No 1 as he won the Singapore Open - his third title in four finals - gunning down Indonesia's rising star Anthony Ginting 10-21, 21-19, 21-13 in an entertaining 73 minutes at the Singapore Indoor Stadium on Sunday. It was his second Singapore Open title but this time he was forced to bring out his best - going the full distance against the hungry Indonesian who got tired as the match progressed. Momota went home USD26,625 richer for his win while Ginting settled for USD13,490 for his efforts. Speaking on television in an interview at the courtside before the prize-giving ceremony, Momota said: "This is a match I was losing. However, Ginting probably got tired as the match progressed and I grabbed the opportunities." With the win, Momota extended his supremacy over Ginting to 7-3 but it came the hard way for the Japanese as he was trailing in the second and third games against the fast and aggressive Ginting. In the second Ginting was leading 16-11 but once Momota got into the rhythm it turned things around for the champion to force a decider. The decider was another Ginting show as he grabbed a 12-8 lead. At this stage, Momota woke up and reeled off nine points in a row to lead 17-12 and the rest is history. "Four years ago I won my first Superseries title in Singapore and I am happy to win it again here," said Momota. World No 1 Tai Tzu Ying of Chinese Taipei ran out 21-19, 21-15 winner against Japan's second seed Nozomi Okuhara, the 2017 world champion, in 40 minutes for the women's singles title. 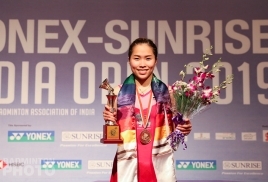 Tzu Ying also won the Singapore Open in 2017. Japan, however, reigned supreme in two doubles events - the men's doubles and the women's doubles. In the men's doubles - world No 3 Takeshi Kamura-Keigo Sonoda dethroned defending champions Mohammad Ahsan-Hendra Setiawan 21-13, 19-21, 21-17 in 51 minutes. Earlier world champions Mayu Matsumoto-Wakana Nagahara defeated Korea's Kim Hye Jeong-Kong Hee Yong 21-17, 22-20 for the women's doubles title. Thailand's number four ranked Dechapol Puavaranukroh-Sapsiree Taerattanachai strolled to the mixed doubles title with an easy 21-14, 21-6 win in 33 minutes against unseeded Tan Kian Meng-Lai Pei Jing of Malaysia.